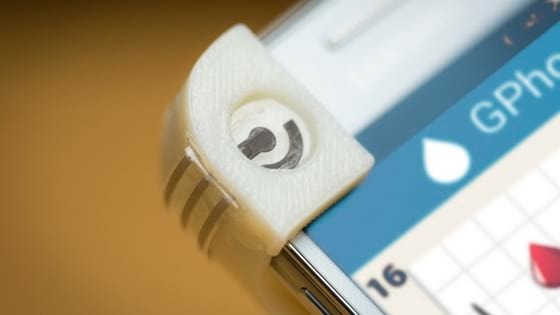 Scientists at the University of California San Diego have created a smartphone case to measure the level of glucose in the blood. It is being developed by a team led by professors Patrick Mercier and Joseph Wang. The 3D-printed case is named the GPhone. It draws its power from the phone's battery. There is a reusable sensor at one of the corners. This sensor is connected to a printed circuit board. The removable stylus on the side is filled with pellets. One pellet is dispensed at a time, and each pellet is for one-time use only. The product is still in the prototype phase. One has to fetch a pellet from the stylus and place it on the sensor. A magnet holds it in place, and the sensor is powered up. The next step involves placing a sample of blood on the pellet. Glucose oxidase, an enzyme present in the pellet, reacts with the glucose in the blood and generates an electric signal. The signal's strength is directly proportional to the glucose concentration in the blood. The electrodes of the sensor measure the signal and transmit the data to the smartphone via Bluetooth. The data is then presented to the user as a number on an application built for the purpose. Data collected over time can be used to track progress, or interpreted in other meaningful ways. Each test run takes around 20 seconds. Once done, the pellet is thrown away, which deactivates the sensor. 1. Cost of the pellets is more than the paper strips used in conventional test kits. 2. Each test run needs at least 12 drops of blood! Research is underway to reduce it to the bare minimum.